Barrel Roll: This pattern allows for so many possibilities with turning flowers on the front plane, it is a must have in every poi dancers arsenal. Reels: Where reels lack in technical pop, their simplicity compensates more than enough by allowing the body of the artist to move more easily without the risk of running into the poi themselves. Under the Leg moves with kicks: A technician might really appreciate the fluidity of a poi artist doing under the leg movements without lifting the leg, yet a dancer might find a lot more expression in the possibilities created when one does lift the leg while performing under the leg patterns, offering an array of kick opportunities. Stalls: Other than allowing for great direction changes, stalls can create a visual staccato that works well in lots of electronic music performances. Corkscrew and interesting variants: By nature of the way a corkscrew moves, the pattern itself makes it easy for a performer to address a U shaped audience and even more so, a crowd situated in the round. Dancers will want this move and lots of variants in their repertoire. Holding the poi: While wearing gloves certainly presents challenges to artists who prefer to feel every minute sensation generated by the shift of the poi in their hands, wearing gloves present a tremendous advantage for dancers who want to hold their poi and move around freely. 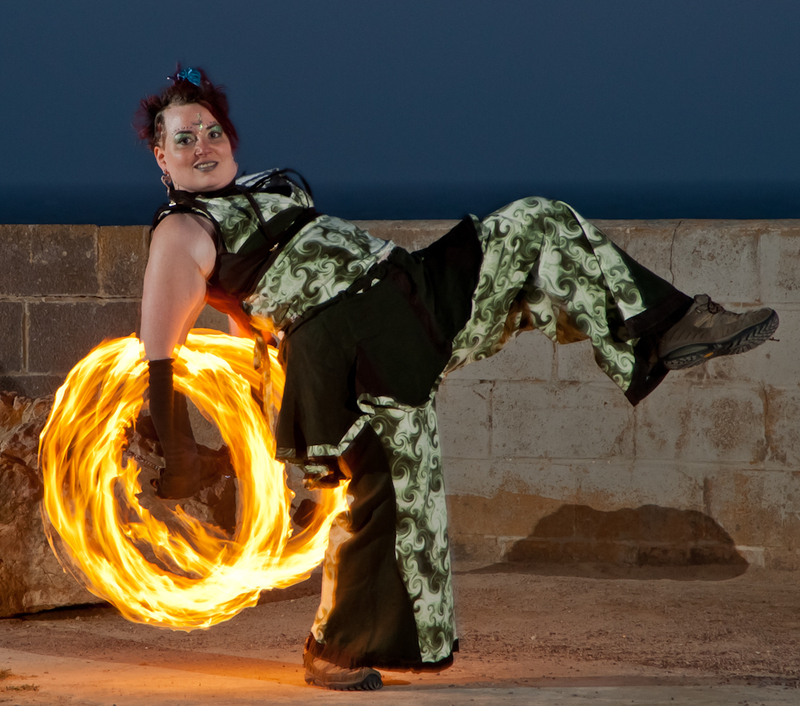 Not only does this trick offer the dancer freedom of motion with their body unencumbered by the poi themselves, holding the fire itself is a crowd pleaser as well. Giant/0 Petal Side Plane Flower turn around: This move allows the artist the ability to turn, extend the arms and traverse space — all critical dance skills. Weave Turn Around: Versatile, fun, and likely to get a crowd response while allowing dancers to move through space, this beginner move is a must have for dancers. Chasing the Sun Turn Arounds in Same and Split Direction: For ease of turning combined with the potential for open and flexible body movements during the execution of these moves, the chasing the sun pattern in same and opposite directions both make my top 10. Something uniquely your own: This should be some more or pattern which you dance with in a way that uniquely expresses your dance style. For me, it’s probably the “funky chicken” as Cary calls it – a front to back reel with a hip hop movement and knees and feet that move in and out. Find your inner funky chicken and let it out to play. Hmm, here in the UK we seem to call Barrel Rolls as Buzz Saws, is that a regional difference or are we just making stuff up? !